Stock photo of the Rocky shore of South Beach after sunset, Pacific Rim National Park, Long Beach Unit, West Coast, Pacific Ocean, Vancouver Island, British Columbia, Canada. 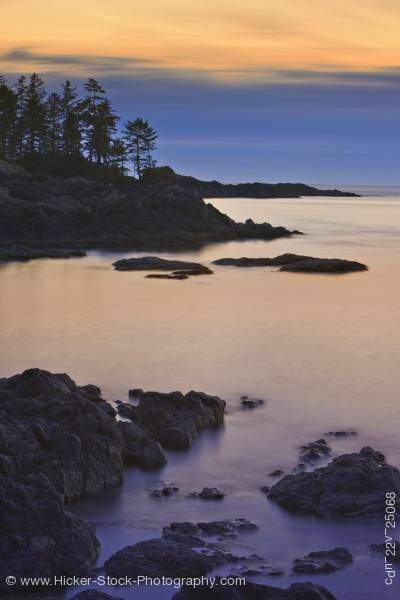 This stock photo shows the rocky shore of South Beach after sunset, Pacific Rim National Park, Long Beach Unit, Clayoquot Sound UNESCO Biosphere Reserve, West Coast, Pacific Ocean, Vancouver Island, British Columbia, Canada. The beauty about South Beach is that it is accessed by, either, a short well groomed walking trail or by a longer rainforest boardwalk hike over some headlands. The sandy beach is backed by thick rainforest while fronted by spectacular marine views. The fine sand attracts people of all ages for relaxation and activity including building sand castles, swimming, beach exploring, frisbee, bocce ball and everything else that you can have fun with while on a sandy beach. At high tide, especially in storm watching season, the ocean waves erupt and transform into crashing forces of nature, sometimes throwing logs and developing into crazy tidal currents. It is always good to be aware of your ocean tides when exploring the Pacific Rim National Park. When conditions are right, the repetitive waves also play by rolling rocks up and down creating music.